Children find our rolling, wooded landscape naturally compelling. Slivers of light break through the branches, forming patches on the forest floor. Flowers hum with bees, and leaves rustle with birds and breezes. Chipmunks skitter across the trails. At the pond, frogs plop into shaded shallows, while turtles soak up sun on a rock. You'll find several ways to share experiences like these with your kids at Garden in the Woods. Watch them play on their own or with other kids in the Family Activity Area, sign up for a Families + Children workshop, or enjoy a scavenger hunt or other self-guided adventure on the trails (see below). Are you an elementary-school teacher, grades K-4? Take a look at our school programs, designed to meet Massachusetts curriculum standards. 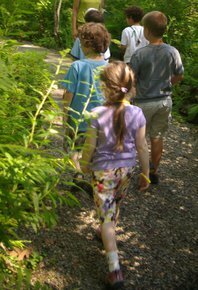 In spring, summer, and early fall, we offer activities for families and children at Garden in the Woods, free with Garden admission. Learn how to plant a tree on Arbor Day, and join us to celebrate seeds on Earth Day. When summer is up and humming, tune into the beauty of bugs, and get to know all about pollinators. You can also take family programs at various locations throughout the region. (Unlike the activities offered at Garden in the Woods, programs for people of all ages cost an additional fee.) Regardless of which programs and locations you choose, please register in advance—they're popular! The main trail (about one mile long) is wide enough for strollers and carriages. Secondary trails pass over some more-challenging, hilly terrain. Bathrooms in the Education Center have changing stations and are accessible. More bathrooms are located in the Visitor Center. Like all other visitors, children must stay on the paths and out of the garden beds, pond, and stream. Our native plant collections contain rare and endangered species that cannot be replaced. Follow the main path over hills, through deep woods, and along the edges of bogs, a brook, and a pond, where you can spot turtles, frogs, and other water creatures. Embark on a scavenger hunt, challenging everyone in the family to use all five senses to explore the Garden: Pick up lists for kids of different ages at the Garden Shop, which also sells snacks and drinks, plus eco-friendly games, toys, and clothing. Go wild in our Family Activity Area, where children can unleash their energy and imaginations. Kids can enter through the magic cottage door and create their own critter cottage under the pines, build a fort with branches, climb through our giant hollow log, and fill up a habitat box with a variety of natural materials. You never know who might move in . . . .
You'll get discounts on Garden admission, programs, and purchases at our Garden Shops. Use this map of the Garden to plan your trip.